Here are some more developments near and around the Attractions area. Peabody Expansion 42 story hotel tower to be built next to the current 28 story hotel. It is supposed to be over 500' tall, Yowsers!! A map showing the area around the Orange County Convention Center. note the future hotels that are planned. Just wondering, has any of these projects broken ground yet? I was at Orlando Premium Outlets yesterday, the Blue Heron towers are almost done. I should have taken pictures. With the additions of the Eden Springs Resort and the Buena Vista Towers, the number of condo-hotel projects in various stages of development now stands at 13, with the projected rooms exceeding 8,000 in the next 21?2 years. Several of the projects already are coming out of the ground, and many owners are offering rooms to potential buyers at prices ranging from the high $100,000s to nearly $750,000. The new rooms are a mixed blessing for the hospitality industry, says Bill Peeper, president of the Orlando/Orange County Convention & Visitors Bureau. On one hand, he says, it is important that the area adjacent to the convention center have more "convention-quality hotel product" in order to maximize the potential of the 2 million- square-foot facility. Conversely, "this projected increase in inventory will create challenges for increasing occupancy, leading to increased competition among hotels for visitors," he says. Condominium hotels, which arrived in force here only recently, sell individual rooms, which owners then can either use themselves or rent as hotel rooms by putting them in a pool and splitting the income with the hotel's operators. The Eden Springs Resort is located on 62 acres of land which includes an 18-acre lake -- formerly the Yogi Bear Campground -- on Turkey Lake Road south of Sand Lake Road, with 1,100 feet of frontage on Big Sand Lake. EB Developers Inc., a Boca Raton firm, closed on the $12 million parcel two weeks ago and estimates it will be ready for development review by the county in four to five months. John Markey, EB's senior vice president, says the four-phase project will be worth $385 million at sellout. Eden Springs has taken a theme park-like approach to its design. Project materials show a detailed storyline about a fictional developer, Thomas Highsmith, who created a luxury resort in the 1920s on the shores of a pristine lake. The developers want customers to buy into the belief that the old property has been restored and enlarged. What the developers don't want, says Steve Iandolo, a former creative director for Universal Orlando's hotel development, is another entertainment hotel like those at the theme parks. "We're selling the real Florida," he says. The design, by architect Helman Hurley Charvat Peacock includes underground parking and several styles of rooms, including tower condominiums and waterfront villas on Big Sand Lake that will allow guests to fish from their balconies. "We want guests to feel like it's been here forever," Iandolo says. The Buena Vista Towers at Village Green, meanwhile, is a planned 25-story twin tower project located near Little Lake Bryan. President Sham Maharaj of Buena Vista Corp., the project's developer, estimates it will be another 45 days before he can release specifics on the project. But Dominick Pickering, a sales agent for MacAnthony Realty, which represents both the Eden Springs and Buena Vista Towers projects, believes construction will begin within six months on the towers, with a two-year construction time frame. The condo hotel, with units starting at $670,000, is currently being marketed on the Web site of MacAnthony Realty, which specializes in sales to international clients. MacAnthony's site describes two-bedroom units with 1,030 square feet and a 76-square-foot balcony. Buyers have a choice of views -- Epcot, Universal or SeaWorld fireworks. The realty company says Buena Vista Corp. is also developing 120,000 square feet of retail and restaurants next to the site, which Pickering describes as having "a Venetian theme -- complete with canals running through it." Pickering says the operator of the property will be one of the flags managed by Starwood Hotels & Resorts, possibly Four Points Sheraton. A Starwood spokeswoman confirmed they are negotiating a franchise agreement. just an update on Shingle Creek......Up to 2 Stories now. I'll try to remember my camera sometime and get some pics. It will be massive once complete..Anyone have any updates on the proposed Peabody financing package with the county? The Vancouver, British Columbia-based firm (NYSE: IDR) plans to start construction on the Village of Imagine this fall on a 29.51-acre parcel it purchased last year for $19.55 million. The village will combine two themed condominium hotels with 1,000 total units and a retail center. The Florida-themed village will be located in the currently undeveloped area across Universal Boulevard from the north entrance to the Orange County Convention Center's 2 million-square-foot expansion. Gregg Anderson, regional vice president of acquisitions for Intrawest Placemaking, says the first phase of the project will include between 120 to 250 condo hotel rooms in one structure, depending on how the units are configured, and about 40,000 square feet of restaurant and retail space, totaling 24 separate concepts. Sales to existing Intrawest property owners will begin this summer, opening up to the public in the fall, with an 18-month buildout, says Gary Raymond, chief executive of Intrawest's Resort Development Group. "Our approach is to pre-sell before the stakes are in the ground," Raymond says. "Last year, we did 94 percent pre-sales." The news of the project is music to the ears of the convention center's Tom Ackert. "We view this development as vital," says the executive director. "It will improve our customer perception of that area, which is kind of isolated at this point, and provide badly needed access to more hotel rooms, retail and restaurant space." At buildout, the village will include two distinctly themed hotels, one styled after the Biltmore in Coral Gables and the other designed like The Breakers Hotel in Palm Beach. The first to be built, in the Biltmore style, features a central tower of up to 12 stories, flanked by town house and amenity structures. An adjacent old town retail area with architectural touches from St. Augustine and Key West makes up the village concept, eventually connecting the two hotels. The second hotel, when built, will serve as a "gateway" to the village area. It will resemble the Breakers' twin-tower hotel, complete with an elaborate base. Further details about the second hotel have not yet been determined. Raymond describes the village as a pedestrian-friendly area with wide streets and a mix of commercial space providing "a sense of discovery." The project, says Anderson, will be done in phases, eventually building out on the parcel at 1,000 units and 50,000 square feet of commercial space. The site is part of a larger, 1,800-acre, as-yet-unnamed parcel located east of International Drive, south of Sand Lake Road and north of State Road 528 that is still in a "state of becoming," since no master plan for the development has yet been announced, says Marc Watson, an Orlando developer. The parcel is owned by Fourth Quarter Properties XLIX LLC, a Georgia company run by partners Stan Thomas, an Atlanta entrepreneur, and Watson. Speculation is that the entire parcel could one day encompass 12,000 to 14,000 hotel rooms, 200,000 square feet of retail space, 200,000 square feet of meeting space and golf facilities. Watson says they plan to create a development targeting the more sophisticated business traveler. "Our vision is to create an integrated urban destination that provides a high-end travel experience coupled with Florida's unique natural environment," he says. The pair acquired the land from Universal/NBC in December 2003 for about $70 million. The former Martin Marietta Corp. site has been undergoing a massive environmental cleanup that will take five more years to complete. It also has been the focus of several controversies, including what some considered a land grab by the city of Orlando late last year to annex the property -- an effort foiled by Orange County Mayor Rich Crotty. A second village area will be built on an 80-acre site within the larger 1,800-acre parcel that Pulte Home Corp. purchased for $75.04 million last August. Watson says the Pulte project will include vacation homes. Although prices for the Village of Imagine units are not set as of yet, Raymond says they tend to be high-cost units, and it is "highly likely" that the properties will be flagged by one or more major hotel chains. That's fine with the convention center's Ackert. "It is important to our meeting planner customers that this development be of the highest quality," Ackert says. "Intrawest is known for that, and it speaks to our credibility as well." Walt Disney World's largest convention resort is now even larger, with the dedication recently of the new, 86,000-square-foot Veracruz Exhibit Hall at the Coronado Springs Resort. The new facility brings the resort's total meeting space to more than 220,000 square feet, with all of the space continuous, on one level, making it easier for meeting planners to configure events. The new hall is built atop a power grid that provides outlets every 30 feet in each direction -- one of the "hidden" elements that also make it user friendly, Disney representatives said. Another six loading docks were added, to go with the existing 10 docks at the meeting facility. Coronado Springs, which opened in 1997, has more than 1,900 rooms and is designed with themes from the American Southwest and Northern Mexico. More meeting space and amenities at other major area hotels and resorts also are in the works or now open for business. The Renaissance Orlando Resort at SeaWorld, a four-diamond luxury resort, recently completed a $1 million renovation of 16 breakout rooms on the second floor, including five executive boardrooms. General Manager Ralph Schmitz said the month-long renovation includes wall covering, carpeting, window treatments, doors and an electronic key-card locking system with multiple programming options. He said meeting planners, for example, can now get a single key providing access to all their meeting rooms. Or they can request keys with restricted access for certain times of the day or specific number of entries. The 778-room Renaissance Orlando Resort at SeaWorld has 185,000 square feet of flexible meeting space. The Walt Disney World Swan and Dolphin hotel recently opened a new art gallery and will unveil a new spa in late summer or early fall. The Mandara spa, located in the Dolphin, will have 13 treatment rooms, among other amenities. The new Galleria Sottil art gallery, also in the Dolphin, features original paintings and sculptures by noted artist Luis Sottil and others. Other recent additions to the Swan and Dolphin include the opening of Todd English's bluezoo, an upscale celebrity-chef restaurant, and the French Mediterranean Market, an open-kitchen breakfast and lunch venue. The Swan and Dolphin, two hotels linked by meeting space and amenities, have a combined 2,267 rooms and more than 329,000 square feet of flexible meeting and convention-exhibit space. so is dellagio located across the street from viscaya, on that undeveloped plot of land next to morton's steakhouse? I always felt that was prime prime real estate, as Restaurant Row is a really hot part of town now. Is that crappy Days Inn still there? The Days Inn site is going to be redeveloped into a mixed-use development with some retail/restaurants, some office use and about 200 condos on the lake. The project has been in the works about a year. I see, really cool. It's very out of place given the location. Any renderings available, or at least a name? The Dead Tree edition of the OBJ has a great rendering of Xentury City. In scope it's EPCOT-like. It contains the Gaylord Palms only as a ... little building on the side. "KISSIMMEE - Later this month, the Gaylord Palms Resort will off Osceola County officials a sweeping new plan to nearly triple its convention space to 1.1 million square feet and add another 500 hotel rooms. The timing of Gaylord's expansion porposal apparently couldn't be better: Xentruy City Development Co. Gaylord's landlord, is reviewing a compreshensive master plan for the 243 prime acres surrounding the hotel-resort that initially would include an additional 500-room condo hotel flagged by an international chain not yet in Orlando. Gaylord's new proposal, which includes a request for a $105 million incentive package from the county, is being offered as a substiture to a plan now under county staff review in which Texas-based FaulknerUSA would develop a $350 million-plus, 250,000 square foot facility with an 800-room hotel. The gaylord already has 400,000 square feet of meeting space. ..."
Also page 9 has an add for the Paramount ... same picture as in the Thornton poster. ... I can't scan. ORLANDO -- Two more condominium-hotels are on the way that will add more than 2,400 units to the market inventory during the next five years. Counting those already in various stages of design and construction, that means the Orlando market in the next half-decade is expected to explode with more than 10,000 condo-hotel units. "Orlando has very good potential for growth," says Alex Pludwinski, a Realtor for Re/Max who is representing the Point Orlando Resort & Spa, one of the new properties. Point Orlando will be located on an 8.4-acre parcel at Universal Boulevard and Carrier Drive. The project, built on land held by Seymour International Inc., will be highly vertical. Awsome. After FAO Schwarz leaving, Pointe Orlando could use a boost. ^ Don't confuse Pointe Orlando where FAO Swartz was with this. Two different unrelated locations I believe. Ahhhh.... 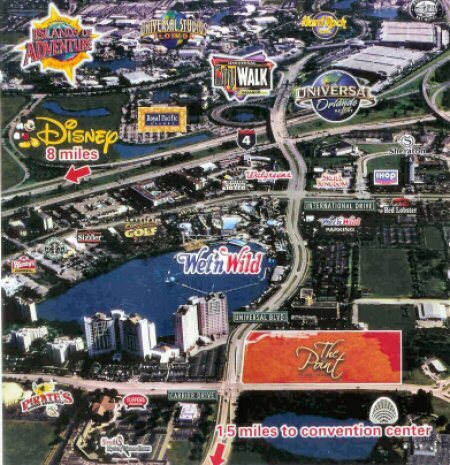 I was thinking of those vacant lots between I-Drive and Universal Drive right next to Pointe Orlando and Wonderworks. I was thinking this was working with a renovation of Pointe Orlando to boost the entire area. Why has Pointe Orlando failed so miserably? Half of the places are vacant, the restaraunts don't get much business and the shops are empty... It's really kind of sad for such a great facility. I think Pointe Orlando doesn't do so well because there is nothing unique about whats there. It isn't great shopping, or dining, or anything really. I know this would never happen but I think it would be cool if they turned the whole thing into a type of bazaar, where locals can open shop and sell things, find of like an upscale flea market with good restaurants and street entertainment. They have these kinds of places all over Europe. The one in Istanbul, the Grand Bazaar, is about a two mile radius and just about the coolest place I've ever been. I know this is sort of a radical idea, but its certainly something that Orlando doesnt have right now. Hey now, but its downtown Orange County~!!!!!!!!!! This is from Orange County Fire Rescue Station 54's personal website homeofthehighrise.com. Sta. 54 is by Sea World they protect Williamsburg, International Drive from Pointe Orlando south to past Central Florida parkway/Orangewood. It seems that after Orlando failed in the annexation, Orange County Government is boasting this!!!!!! It should be City of Orlando Station 54. I gotta bad feeling that Orange County and thier (Mayor) are going to try and force a consolidation like what happened in Jacksonville in 1966. There is some strange politics going on right now. I want Orlando to grow but nice and smoothly and by annexation not unification or consolidation.